9:10 a.m. We will be liveblogging the 24 Hours of LeMons race at Autobahn Country Club all day. This was originally intended to happen on Hooniverse.com, but that site is currently having some technical issues so we'll make the best of it here and then copy and paste it to Hooniverse once that site is back up. 9:25 a.m. Car count should be around 95 starters today. 9:41 a.m. 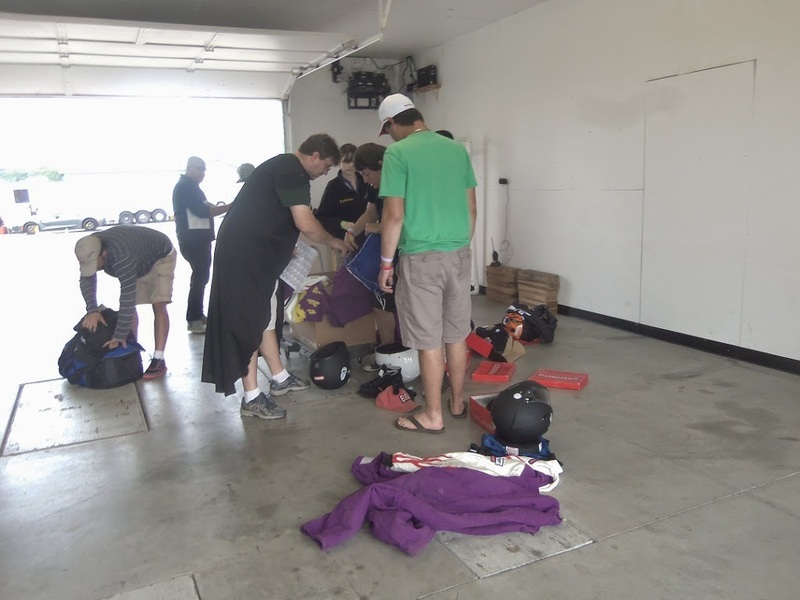 While most teams are organized for gear tech, some opt for the "Unbox and toss it all on the tech shed floor" approach. 9:45 a.m. Cars are out and circulating before the green flag. Fifteen minutes until the race starts. The Little Lebowski Urban Achievers' Volvo 245 is already ahead of where they were at Gingerman, as the car is running on race day. 10:00 a.m. Green flag! The #33 We Are Not Really From Iran take the green flag first. Supra Troopers lead the first lap in anger. Only 14 hours until midnight checkered flag. 10:15 a.m. Full-course caution for a rollover of the #422 Honda Civic, which is sporting a Led Zeppelin theme with a zeppelin mounted on the roof. 10:30 a.m. Civic driver checked out OK with the medic. The blimp is wrecked somewhere near the far corner of the racetrack. 10:51 a.m. Early on in the race, the Supra Troopers turbocharged Supra leads by 13 seconds from the One Percent Racing BMW E28. College Brats' Chevy Cavalier leads Class B and runs fourth overall. The real battle should be in Class C, where Der Schnitzelwagen's VW Squareback leads Windy City Racing's automatic-equipped BMW 2002 and the Afunzalo Racing Fiat X1/9 by just a few seconds. Der Schnitzelwagen famously led last year at Autobahn by 25 laps at the end of day one, running on only three-quarter throttle. They "fixed" their throttle issues for the next day and promptly nuked the the air-cooled engine to lose the class. 11:25 a.m. All updates should be over on Hooniverse here henceforth. Doesn't look like he had the chance before it wall went horribly wrong.